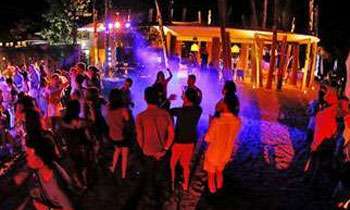 A British woman and an Indian man died in two separate incidents while holidaying in Mirissa and Hungama, police said. The British woman (52) who was staying at a hotel in Mirissa, Weligama was admitted to the Matara Hospital on Friday (11) night due to a sudden illness. Police said the woman had collapsed at a beach carnival and had died on admission to the hospital. The post-mortem had revealed the cause of death as a heart attack. Meanwhile, a 33-year-old Indian man who was attending a special tourist camp at Ussangoda, Hungama also died on Saturday (12). The camp, organised for the seventh consecutive year was said to have visitors from 70 countries and was scheduled to end on January 15. The Indian national who was admitted to the Ambalantota Hospital after he was found unconscious, died while undergoing treatment. Police said the post-mortem examination will be held today (13) and that the Hungama Police are investigating the incident. The south, the beach. It is all patriots, drugs and thugs. I used to visit Unawatuna and stopped due to the rulenessless in the area. May foreigners die in Sri Lanka and only a very few Sri Lankans die overseas other than in the Middle East. Sri Lanka cannot protect its own citizens and even foreigners. GMOA is buy in politics. Haha you think GMOA should protect foreigners? YOU > I did not mean GMOA mean must protect foreigners. If you understood it that way, it shows your literacy level. Sad to say that. What I meant was that tehj GMOA doesn't have a strategy nor a system that is focussed on such issues because when foreigners die in our country like this, it reflects bad on our country. Now do you understand? In return it affects our struggling economy. We Srilankans are not god to save people from natural causes of death..many people who have bad health issues mainly from the western countries sell all their life savings and come to enjoy their life till the last moment in this island...As srilanka is a place where you can enjoy with a little money...of course there are thugs and rowdies...but doesn’t every country have them?